Now, the reason we have few pro-life atheists is that being pro-life makes absolutely no sense without God. Because unless one believes in a God who created them, loves them and died for them, a person will simply be unable to understand why life has value. And that’s why the sanctity of life makes no sense to so many people in our society today. They believe what most of us were taught in school: that we are essentially evolutionary mistakes, each of us existing as soulless and uncreated beings, the result of a chain of replications of the descendants of the first organism, which itself was the product of a random collision of atoms in the primordial swamp. Since we are all basically cosmic mistakes, who cares if some of us are sacrificed for the benefit of the others? Those sacrificed are just as meaningless as we are. Sounds depressing? Here’s something worse — this is what someone without the Gospel actually believes! But there is hope. Our reading today reveals the source of our worth as human beings — and His name is Jesus Christ. And in this verse John the Baptist’s followers want to know if Jesus is the true messiah, or if they should wait for someone else. But Jesus’ response is telling. He says, “Go and tell John what you have seen and heard: the blind receive their sight, the lame walk, lepers are cleansed, and the deaf hear, the dead are raised up, and the poor have good news preached to them.” So notice in this verse how Jesus proves who He is — He does it by healing and by giving life! You see, Jesus is life, and because of this unique identity, Jesus seeks to give that life to all of us: by healing us, raising us from the dead, dying for our sins, and sharing His life-giving Gospel with the world! And so with Jesus is in our lives we have infinite worth! We are beings who have received our earthly lives and even everlasting life from the author of all life — Jesus Christ our Lord! Prayer: Lord, we thank you for your gift of life, and your willingness to share it with all of us. 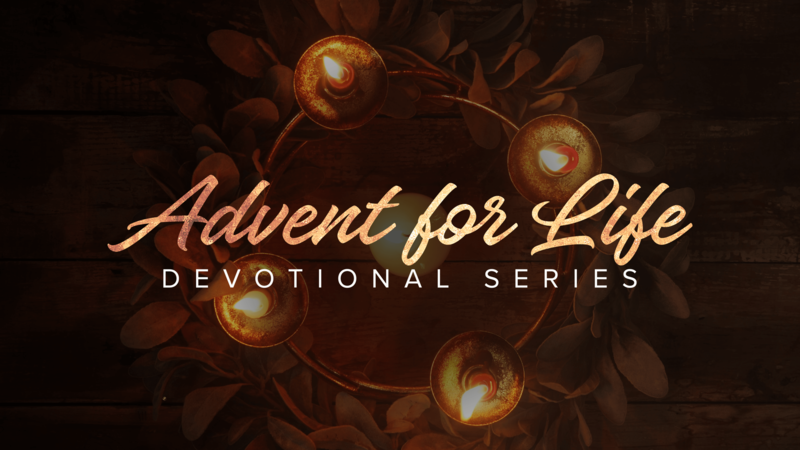 We ask especially that you share that life with unbelievers this Advent — through your healing, through your power to console, through your forgiveness, and through your consoling presence. In Jesus’ name we pray. Amen. Pro-Life Action: The first step in any pro-life witness is to share Jesus’ life-giving Gospel with another person. So, during this Advent, let at least one person know that Jesus loves them, that He died for them, and that He is willing to forgive them today. Let them know that they are not some cosmic mistake without purpose — rather, they are children of God, fashioned by a loving Father. Today’s devotion was written by Rev. Dr. Dennis R. Di Mauro, pastor of Trinity Lutheran Church, Warrenton, VA and professor at St. Paul Lutheran Seminary.